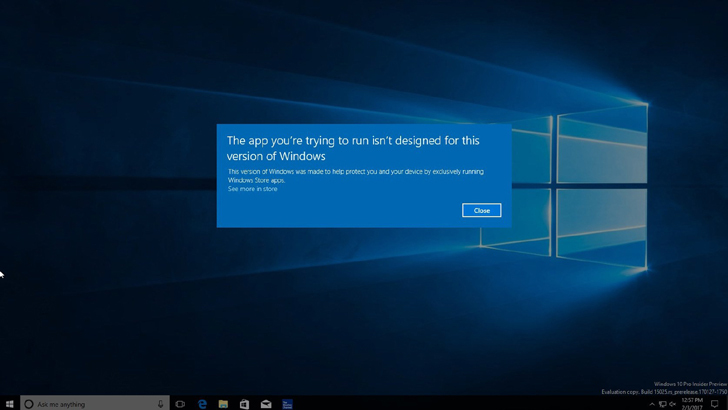 It's Windows 10, but with tighter restrictions on what you're allowed to run. To date, Microsoft has had a simple strategy for fighting Chromebooks: make low-cost Windows laptops that negate Google's price advantage. However, it now looks to be extending that strategy to the operating system itself. Both Windows Blog Italia and Thurrott have gotten a peek at Windows Cloud (or Windows 10 Cloud, depending on who you ask), a spin on Windows 10 that appears focused on beating Google's Chrome OS. It largely behaves the same as Windows 10, but its stand-out feature is what it doesn't do -- namely, run conventional Windows apps. At least right now, Cloud will only run Universal Windows Platform apps found in the Windows Store. Try to run anything else and you'll get a stern warning. Most likely, this is to court schools and other institutions who see Chrome OS' lack of native apps as a security advantage. Educators may be more likely to stick to Windows PCs if they know that kids can't infect a machine with malware or install an unapproved game. It's possible that Microsoft's "Centennial" bridge (which brings Win32 apps to the Windows Store) should work, but there are conflicting reports about compatibility. It's not certain when Windows Cloud might show up. With that said, there are mentions of the OS in current Windows Insider preview releases. That suggests Microsoft intends to release Cloud relatively soon, and could ship it (or just talk about it) when Windows 10's Creators Update arrives in the spring. The timing would certainly be right. Schools tend to prepare their tech budgets months before the start of classes, and Microsoft will need Windows Cloud-equipped PCs on the market very soon if it's going to lure the educational crowd away from Google's offerings.